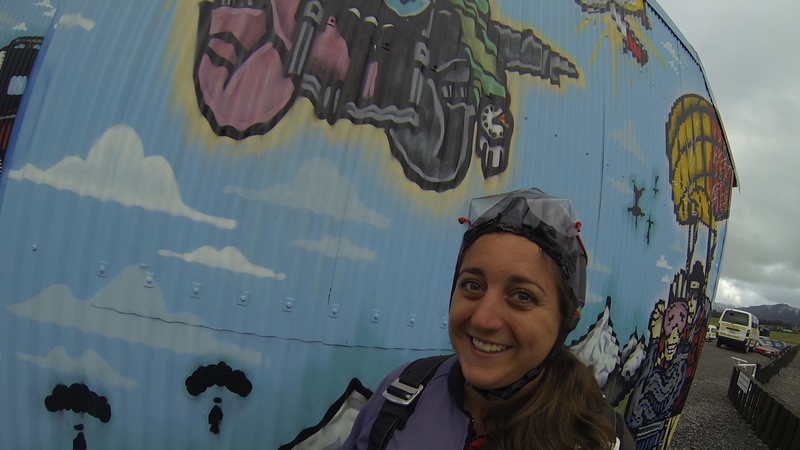 Falling from the sky: Skydiving Fox Glacier, New Zealand – These Two Eyes! “I don’t feel any nerves or anxiety. Maybe it’s because I know I won’t jump, or more likely because I’m just secretly hoping the whole thing is called off due to the uncertain weather and then I won’t even have to make the decision to jump or not,” I wrote the morning of. Of course I always prefer a good reason to an excuse. 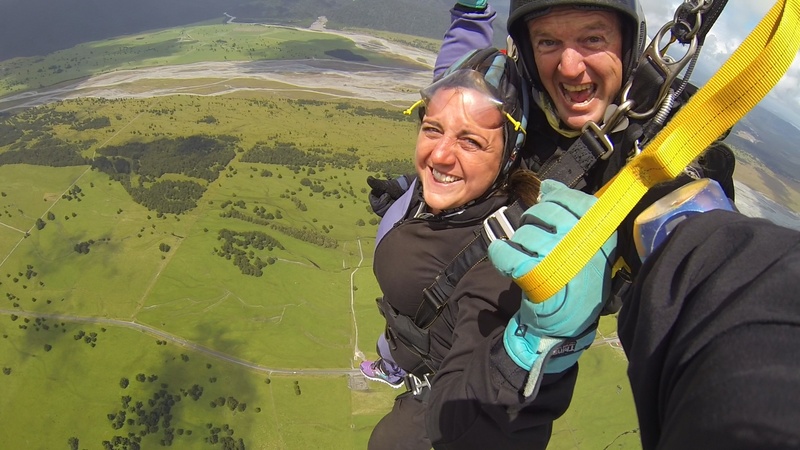 I’ve never had a strong desire to skydive, although I will admit that every time I come and go to New Zealand I always leave with a teeny tiny regret of not participating in the adrenalin-obsessed country’s biggest tourist adventure. I woke to a buzzing alarm earlier then I would have preferred and pushed the curtains aside at Sunset Motel. In view, thick and bushy grey clouds and dense fog covered the Southern Alps along the West Coast of the South Island in New Zealand. More importantly, hidden behind the haze was the face of Fox Glacier, a massive retreating icy structure I’ve yet to see in a clear view. 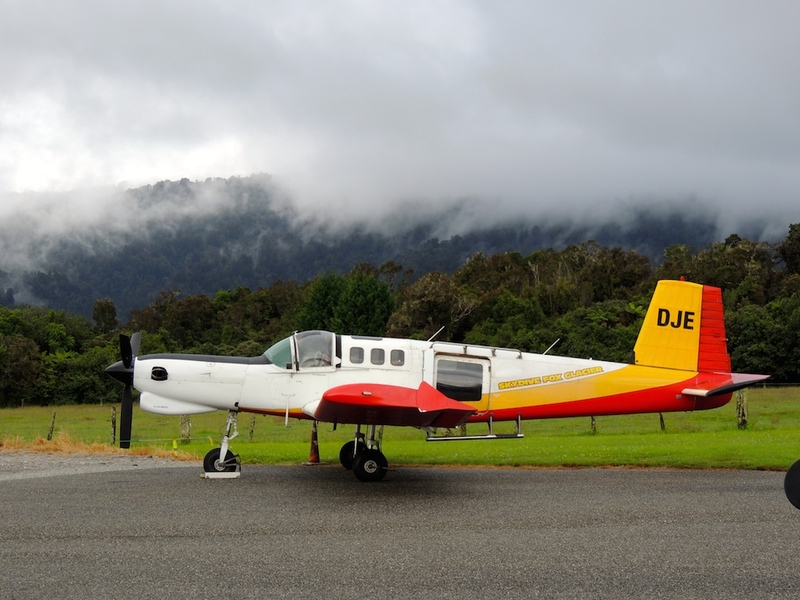 We arrived at Skydive Fox Glacier on time for our early morning appointment. Wes, Ceri and Rob had booked months in advance and paid up front. Backing out wasn’t an option for them, and even better the Aussie dollar was more favorable at their time of booking. A week prior to arriving I made a phone call and confirmed that putting my name alongside theirs just guaranteed there would be a slot should I want to jump, but there was no monetary obligation to do so at that time. I took that as an indicator that it was okay that I would ‘maybe’ jump but assumed the likelihood that I actually would was very, very slim. As the gang approached the office I took a quick wander over to the small plane parked in the bunker. One glance at the size in conjunction with the modest glass door I presumed I would potentially be jumping out of and I said “nope, count me out.” At that point Francoise, a 25-year skydiving veteran and part owner, pulled me aside for a chat and before I knew it my plans for the afternoon took a very unexpected and fear-provoking turn. In his soothing South African accent Francoise talked me through the process. We discussed my fears, which I couldn’t exactly pinpoint. We walked through the safety process, including the backup parachute and the probability of unfavorable events. With over 9,000 jumps under his belt I trusted his experience. We agreed that we’d go together and more importantly, we’d go first. Before I knew it I was wearing a jump suit, a silly cap and harness. Once I was fully suited up along with the rest of the group I turned to my adviser Francoise and said, “Um, I sort of have to pee”. I sat in a corner on the outdoor wooden bench taking deep breathes and mentally battling my anxiety away as my friends sat across from me making jokes. I couldn’t quite understand how they so discreetly masked their fear. But just as I started to get used to the idea of willingly leaping from a moving aircraft we were approached and told the bad news. In professional and honest practice we were informed that although it was safe to jump from the launch point, it was too cloudy and the likelihood of us seeing any of the beautiful landscape was minimal. We had to make a call to jump anyway, or postpone it with no penalty. We only had a few hours available before having to move on with our road trip down the West Coast to make it to our next destination in time. We took a vote and agreed that although disappointed, the anxiety and cost wasn’t worth it if we couldn’t see the glacier and decided to take some time out and see if the weather would settle throughout the morning. 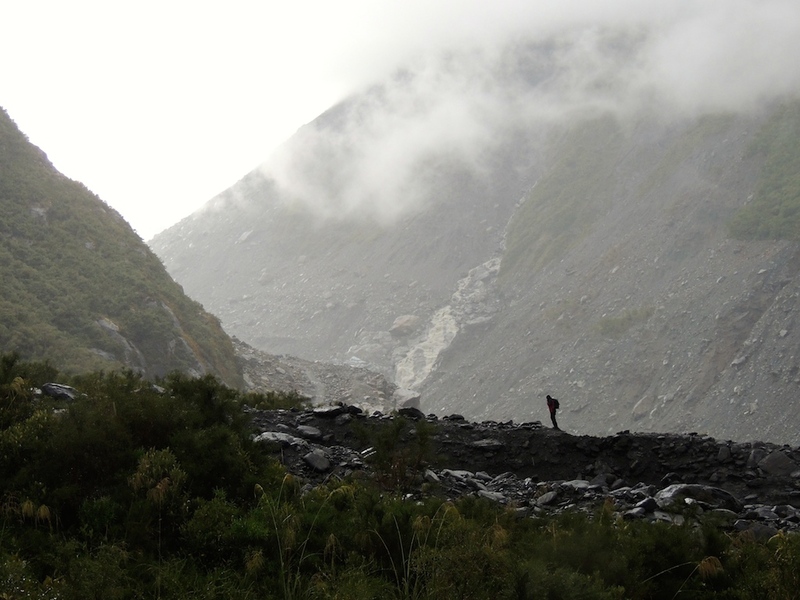 In a cold and torrential downpour we walked the base of Fox Glacier and I willed the clouds away so I could grab a clear shot with my camera but to no avail. We moved on to breakfast at Matheson Café on Lake Matheson overlooking the Southern Alps and watched and waited for the clouds to shift as the sun slowly crept in between them. We headed back to the skydiving headquarters to let them know that we were closely watching the sky and would be back in a few hours. How timely as just then it cleared and they informed us that very moment was likely the most opportune time to jump. Ahhh, was it really going to happen? All my anxiety rushed back and I started to have doubts again. This time, I had a belly full of muesli and a fear of vomiting onto my tandem instructor added to the list of uncertainties. My boy Francoise was there for me again, as I wouldn’t have gone with anyone else at that point and he assured me he’d be there for me throughout the whole occasion. We suited up again, much quicker and a bit more self-assured. Faster than expected the call was made. I witnessed a few thumbs up and and then oh-my-gosh it was go time. Rob and I waddled to the plane as our instructors followed us, GoPro’s attached to their wrists to record the whole event. Rob and his instructor Paul shuffled themselves away from the exit through the metal passenger tube towards the nose of the small single engine aircraft before Francoise and I settled in at the door. Immediately he connected us at my lower back, then the top bit behind my shoulders and talked me through how we were safely fastened together while tightening the straps. He calmly explained that the noise was the testing of the engine and a few seconds later, take off. This was now the point of no return. Francoise slid the door open and without hesitation hurled me out of the plane. I heard him later telling one of the other instructors that he heard me scream a few profanities when the door opened and just went for it, not taking the time to sit on the ledge as many others do knowing that would only increase my apprehension. Gravity did its thing as I fell from 16,500 feet at 200 kph toward the ground below. The first ten seconds were exhilarating. I felt my heart in my throat and a high sense of fear and confusion mixed with adrenaline. For an entire minute after that, literally I free fell for over one minute, I was still falling at terminal velocity and experienced the most intense range of emotions. The air was so cold and the wind hurt like being slapped in the face a million times over. For a second I even thought my nose would bleed. I had to remind myself to take in the magnificent scenery all around me as I dropped through the clouds. I only let out a few screams and then with a massive jolt the parachute finally opened. I went from 200 kph to 10 kph in four seconds. I did it! I did it! The hard part was over and I looked up and there was Rob floating down not too far in the distance. How cool to see each other. Francoise handed over the parachute reigns and I pulled down with my right arm to steer us into view of the coastline. A pull down with my left arm and we were facing the mountains again. As I didn’t want to experience any motion sickness we kept it calm and left all the swirls and twirls to the more adventurous. This was the part I enjoyed the most; just calmly floating in the air, watching the sea, the mountains and lush green grass below. High fives all around, proud of each other for such an incredible and brave accomplishment we cheered. Throughout the entire event I never thought I was going to die, or even fathomed the thought. It was all just a big ball of anxiety and apprehension, but that’s normal of course when you’re fleeing yourself from the sky for the first time. Just like the Francoise said, if I didn’t have a sense of fear to jump then I’d be crazy and they don’t jump with crazy people. 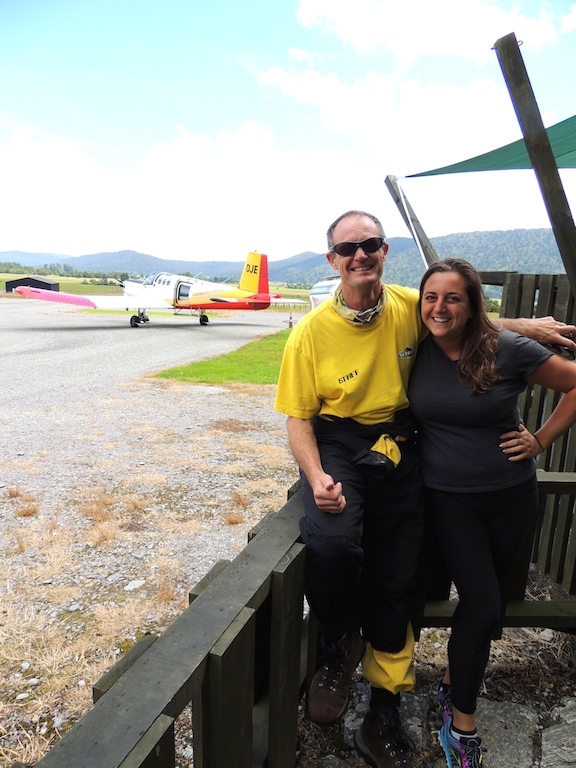 As we pulled away in our rental car from Skydive Fox Glacier we turned to each other and said, “Um, I need a beer!” So we celebrated. I never thought you would jump out of an airplane, but I also never thought you would swim with the sharks! I am so proud of your energy and sense of adventure! Love you!